Readings! Performance! A Raffle! Refreshments! Animals! Animal-Aside is a lyric and conceptual exploration of the animal continuing the conversation started in spring with Animal/Antidote. There will be human animals and possibly others. With Melanie Noel, Doug Nufer, Stacey Levine, Johnny Horton, and Jennifer Calkins. Free. 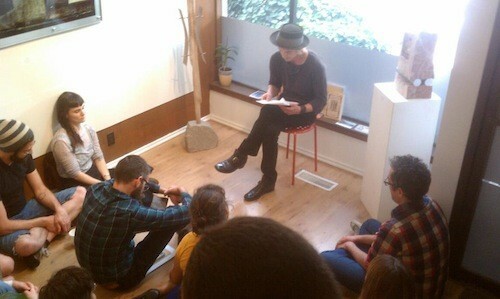 Readings from bay areas Alli Warren and Lindsey Boldt and Seattles own Gregory Laynor. Join PageBoy Magazine for an in depth exploration into the inbred text. As we crawl from venue to venue we will discuss instances of textual in breeding while generally making ourselves sick on the poetic plethora. Drinks will be available. An evening of readings and performances on the Animal--modeled as an antidote to the long day youve spent in serious discussion. Readers include Doug Nufer, Amina Cain, Stacey Levine, Jennifer Calkins, Bhanu Kapil, Sarah Dowling and Anne de Marcken. Refreshments will be served. And a raffle! Come celebrate PageBoy Magazines sixth issue with poetry readings and music! The issue will also be available for purchase.